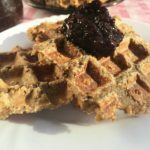 Healthy Oat Waffles - Anna Can Do It! - Incredibly easy and delicious Healthy Oat Waffles ready within minutes! No flour, no added sugar, no egg! These healthy waffles give you the energy kick-start for September. Mix the flax seed meal with the water to create flax egg. Let it sit while you combine the other ingredients. Stir the ricotta to the banana mash. Pour the oat flour or oat meal to the banana-ricotta mixture. Add the flax egg and mix everything well together. Pour the mixture to a waffle iron. It'll be tricky to spread in the waffle iron since it's thicker than a normal waffle batter, use a spoon to level it. Be sure you eat it while it's warm, because once it's cold it'll turn rubbery!